The Ahmadiyya Muslim Community is pleased to announce that on 13 May 2016, the World Head of the Ahmadiyya Muslim Community, the Fifth Khalifa (Caliph), His Holiness, Hazrat Mirza Masroor Ahmad inaugurated the Mahmood Mosque in Malmo, Sweden. It is the second Mosque built by the Ahmadiyya Muslim Community in the country. After unveiling a commemorative plaque His Holiness proceeded to deliver his weekly Friday Sermon, which was broadcast live around the world on MTA International. During his sermon, His Holiness emphasised the need for Ahmadi Muslims to fulfill the true peaceful purposes of the Mosque, while also praising the exceptional sacrifices made by members of the community. The Khalifa recounted a number of examples of personal financial sacrifices made by local Ahmadi Muslims towards funding the Mahmood Mosque. Men, women and children all took part in this effort.For example, one man sold his car, whilst some ladies donated jewellery and young children offered their pocket money. His Holiness said that all such sacrifices were made in order to gain the pleasure of God Almighty. The Khalifa said that it was the responsibility of Ahmadi Muslims to invite people towards the Oneness of God and to dispel false notions about Islam. “It is a source of deep regret that today the most discord and conflict is found amongst Muslims. 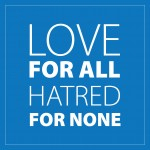 Therefore it is the responsibility of Ahmadi Muslims to become living examples of the peaceful teachings of Islam and to spread its true and beautiful message far and wide.